KemPharm’s LAT™ technology is well represented by current products in various stages of development with designs that are believed to offer potential treatments of Attention Deficit/Hyperactivity Disorders (ADHD), pain, and diseases of the Central Nervous System (CNS) . KP415 is our prodrug product candidate being developed for the treatment of ADHD. KP415 consists of serdexmethylphenidate (SDX), KemPharm’s prodrug of d-methylphenidate (d-MPH), co-formulated with immediate-release d-MPH. KP415 is designed to address unmet needs with currently marketed methylphenidate ADHD treatments, including earlier onset of therapy, longer duration of therapy and consistency of the therapeutic effect. In addition, the SDX component of KP415 may offer the possibility of a lower abuse potential. KP415’s safety and efficacy were assessed via a multicenter, randomized, parallel, double-blind, placebo-controlled analog laboratory classroom clinical trial in 150 children aged 6-12 years old with a diagnosis of ADHD. Results from this pivotal study of KP415 met the primary endpoints for efficacy, with data suggesting an onset of action at 30 minutes and a duration of effect of 13 hours. KP415 was also the subject of a Human Abuse Potential (HAP) program, which was designed to assess the abuse potential of SDX in comparison to d-methylphenidate via the intravenous, intranasal and oral routes of abuse. The program included three FDA required clinical trials, KP415.A01 (oral), KP415.A02 (intranasal) and KP415.A03 (intravenous) as well as tampering studies. In summary, results from the HAP program suggest that the SDX component of KP415 may have lower abuse potential than relevant d-methylphenidate comparators when misused intranasally, intravenously, or orally at high doses. Based on these attributes, if approved, we believe KP415 has the potential to be one of the first truly differentiated methylphenidate products launched in the ADHD market in the past several years. KP484 is KemPharm’s co-lead clinical development candidate being developed for the treatment of ADHD in patients that respond best when a very long duration of therapy is required. Similar to KP415, KP484 also consists of serdexmethylphenidate (SDX), KemPharm’s prodrug of d-methylphenidate (d-MPH). Preclinical and clinical studies of KP484 have demonstrated that the prodrug may produce a longer duration release of d-MPH compared to the most prescribed methylphenidate products. Based on this release profile, we believe KP484 could enable KemPharm to target the large and growing population of adult ADHD patients. It is estimated that approximately 10.5 million adults have ADHD, making adult patients the largest segment of the ADHD market. Our plan is to develop KP484 in parallel with KP415 and potentially leverage data from our KP415 research, including pharmacokinetic and human abuse liability studies. Should the development of KP484 continue as planned, it has the potential to be the first new methylphenidate-based product being developed with the intent to address the specific needs of the adult ADHD population, which we believe remains largely underserved. KemPharm is developing KP879 as an extended-duration, agonist replacement therapy for the treatment of Stimulant Use Disorder (SUD). KP879 utilizes serdexmethylphenidate (SDX), KemPharm’s prodrug of d-MPH which is also the primary active pharmaceutical ingredient of KP415 and KP484, the company’s co-lead clinical development product candidates which are intended for the treatment of ADHD. SUDs include those marked by abuse/misuse of cocaine, methamphetamines, prescription stimulant products that contain methylphenidate or amphetamine, and numerous designer stimulants including, for example, 3,4-methylenedioxypyrovalerone (MDPV) and 4-methylmethcathinone (mephedrone) (“bath salts”). According to the Substance Abuse and Mental Health Services Administration (SAMHSA), in 2016, among Americans older than 12 years, there were approximately 1.9 million current users of cocaine, 667,000 users of methamphetamine, and 1.7 million current misusers of prescription stimulants. To date, there are no FDA-approved medications for the treatment of SUD. Among the many potential drug therapies that have been studied for the treatment of SUD, medications with CNS stimulant-like properties have shown the most benefit. It is believed that by enhancing dopamine signaling in key brain areas, agonist replacement therapies may decrease craving and use of illicit stimulants, promote restorative sleep, and increase retention time of patients in substance abuse therapy. However, prior agonist replacement therapies have been limited in part by concerns of their own abuse potential among the stimulant-abusing population. Based on information gathered during the KP415 and KP484 development programs, KemPharm believes that SDX has pharmacokinetic properties that are desirable as an agonist replacement therapy for the treatment of SUD. Specifically, KemPharm observed that SDX provided a gradual onset followed by long duration of d-MPH exposure, while also exhibiting the potential for a reduction in abuse-related effects. Given these properties, KemPharm is advancing KP879 as a potential first-ever therapeutic treatment for SUD. 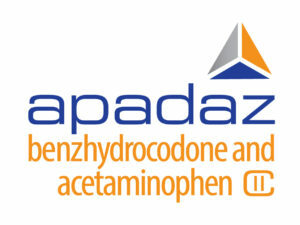 APADAZ® (benzhydrocodone and acetaminophen) is a combination of benzhydrocodone, a prodrug of the opioid agonist hydrocodone, and acetaminophen that was approved by the U.S. Food and Drug Administration (FDA) on February 23, 2018. KemPharm announced its entry into a definitive collaboration and license agreement with KVK Tech, Inc. for the U.S. commercial rights of APADAZ on October 30, 2018. The commercial launch for APADAZ is planned for the second half of 2019. Click here to view the product label.